Thanks to everyone who came to check the film out in Austin - we all had a great time at SXSW, and I think we definitely converted a good deal more Scott fans. Let the obsession begin! The only drawback to having a film in a film festival is that you rarely have time to see other films. 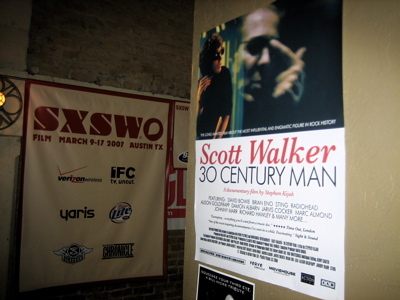 Luckily I was able to catch the luminous and moving “Kurt Cobain: About a Son” by AJ Schnack as well as a new print of Bruce Weber’s classic portrait of Chet Baker, “Let’s Get Lost” which was the film that gave me the idea to do a film about Scott Walker in the first place. Finally get to bring it on home! You are currently browsing the SCOTT WALKER weblog archives for March, 2007.